Want a brand new Corvette for one-six thousandth of the cost? If you have the ability to speak, you probably answered “Yes” to that question. And if you did, then today is your lucky day, because the National Corvette Museum is raffling off a 2015 Stingray for $10 a ticket. The NCM frequently has fundraising raffles, but the normal cost of a ticket is about $100. 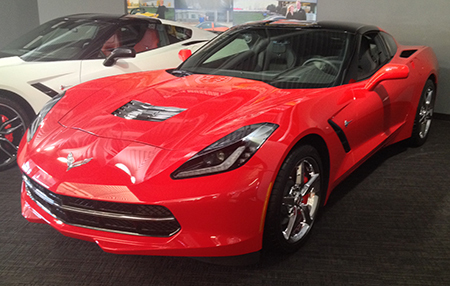 The Bowling Green-based museum is making an exception for one raffle, though—the 2015 Torch Red Coupe Corvette Stingray, which will be raffled off on Thursday, January 29th, at 2 pm. Because the buy-in price is so low, the museum is selling an unlimited number of raffle tickets for the cherry Vette. On one hand, that means you’re competing with a lot more people than usual (the NCM typically only sells 2,000 raffle tickets per car). On the other hand, it means you can buy as many tickets as you want to increase your (admittedly small) odds of winning. For your shot at buying a 2015 Corvette Stingray for $10, hop on over to the National Corvette Museum’s official website.